Since women earned the right to vote a little under one hundred years ago, our progress hasn’t been the Olympic sprint toward gender equality first wave feminists hoped for, but more of a slow, elderly mall walk (with frequent stops to Cinnabon) over the four hundred million hurdles we still face. Some of these obstacles are obvious —unequal pay, under-representation in government, reproductive restrictions, lack of floor-length mirrors in hotel rooms. But a lot of them are harder to identify. They’re the white noise of oppression that we’ve accepted as lady business as usual, and the patriarchy wants to keep it that way. Erin Gibson has a singular goal - to create a utopian future where women are recognized as humans. 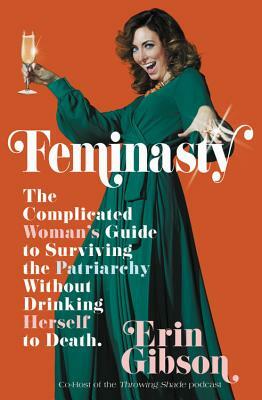 In FEMINASTY—titled after her nickname on the hit podcast “Throwing Shade”—she has written a collection of make-you-laugh-until-you-cry essays that expose the hidden rules that make life as a woman unnecessarily hard and deconstructs them in a way that’s bold, provocative and hilarious. Whether it’s shaming women for having their periods, allowing them into STEM fields but never treating them like they truly belong, or dictating strict rules for how they should dress in every situation, Erin breaks down the organized chaos of old fashioned sexism, intentional and otherwise, that systemically keeps women down.